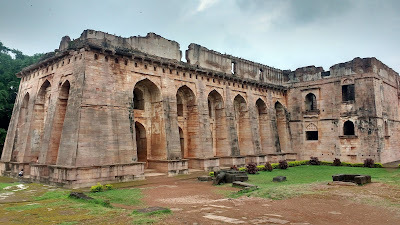 Mandu - or Mandavgarh or Mandav - is described as a place lost in time. 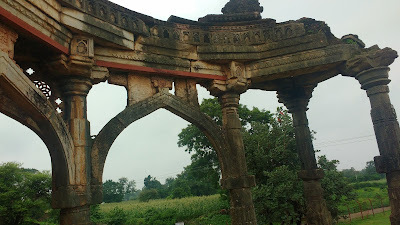 The old fortress of Mandav is perched at the southern edge of Malwa, overlooking the Narmada. 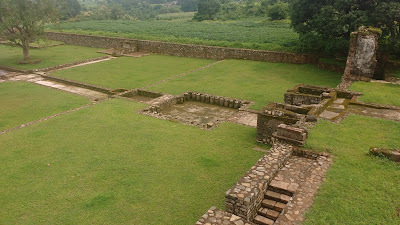 It assumed importance in the 13th century when the Parmara kings of Dhar shifted their capital here due to its elevation and strategic natural defences. 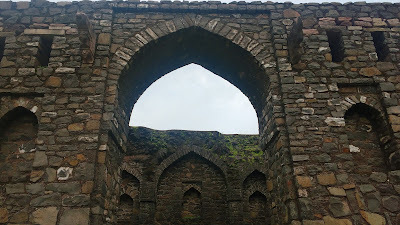 Mandav saw its glory days in the 15th-16th centuries under the Khilji Dynasty - an offshoot of the Delhi Sultanate. Subsequent power struggles saw the gradual decline of Mandav. The 18th century gave the last fatal blow to the town when the Marathas shifted the capital of Malwa back to Dhar. Almost three centuries later, the old town still reminds people of its glory in the magnificent monuments that have remarkably stood the test of time - with their timeless arches and design synergy between the earth, the light and the water. The primary access for Mandav is through Indore, via Dhar. Mandav is 40km away from Dhar, which in turn is 70kms from Indore. Local buses are available at a good frequency. There are a few direct buses between Indore and Mandav via Bagri-Digthan. Both these routes converge near Bagri and pass through Lunhera-Nalchha and approach Mandav through the Almgir Darwaza and Bhangi Darwaza in the north. An alternate access is available for people coming from Maheshwar via Dhamnod. 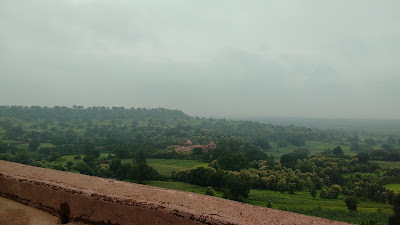 The road forks off the Mumbai-Agra Highway at Palash Hotel and approaches Mandav through the Sonagarh Fort in the south via the hamlet of Bamanpuri. The road is narrow and has spotty bus connections. 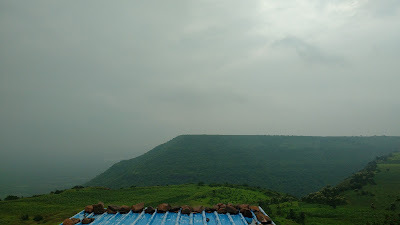 This route though makes up for the rough ride with imposing views of the Malwa plateau and the crest of the Roopmati Pavilion. Getting around Mandav is a different ball-game altogether. 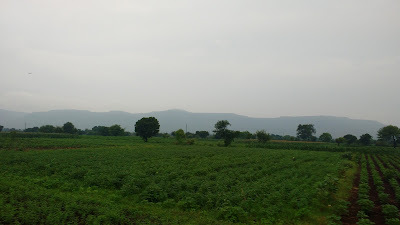 Mandav is located on a plateau with moderate inclines and hence is cycle-friendly to an extent. 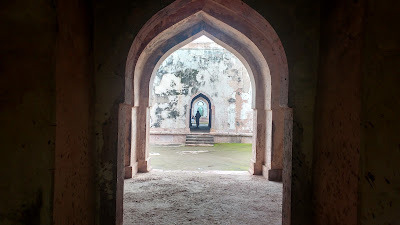 The northern-most point is the magnificent Delhi Darwaza, while the southern-most is the Baz-Bahadur Palace. The distance between these two is about 8kms. 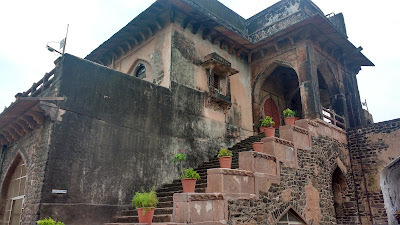 The Roopmati Pavilion is located close to the Baz Bahadur Palace but has a steep gradient. Basic cycles can be rented at two small shops next to the ubiquitous Shivani Restaurant. Alternately, rickshaws and other transports can be rented near the Jama Masjid. 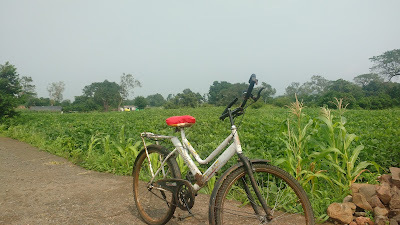 I rented a cycle at one of the stores and covered Mandav through the day from south to north. The sites are organized in clusters accessible from a common entrance. This cluster is located at the southern end of the Mandav. The cluster monuments are ticketed at a combined price of Rs. 15. 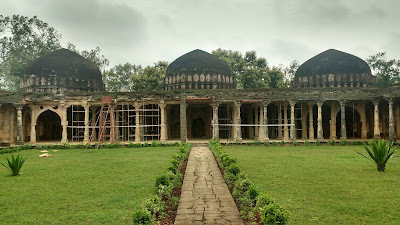 The Roopmati Pavilion rests at a lofty elevation at the edge of the plateau, overlooking the Nimar plateau and the Narmada. 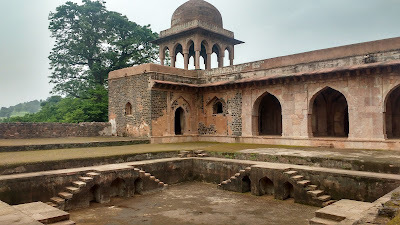 The pavilion was actually a sentry outpost which was converted during Baz Bahadur's time so that his consort - Roopmati - could view her beloved Narmada flowing through the Nimar plateau. 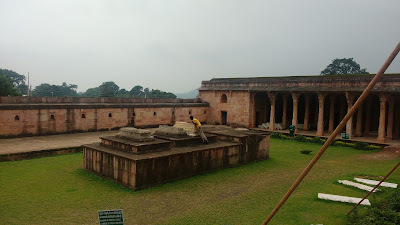 The pavilion also overlooks the Baz Bahadur's Palace and Rewa Kund to the north. There is a toilet at the western end of the monument and even that has fantastic views of the Nimar. 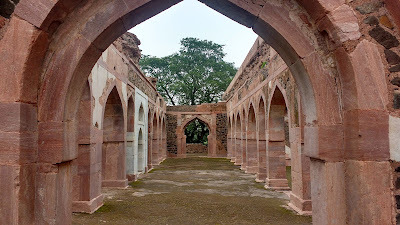 The Baz Bahadur's palace is a multi-storey building with open spaces, arches and a pool (now defunct). The upper terraces have brilliant views. 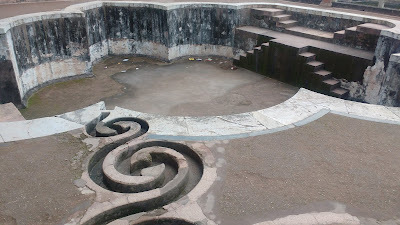 The Rewa Kund is located next to the palace. 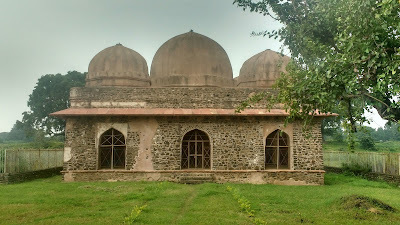 It actually predates the palace and was a usual 'hangout' of Roopmati and hence, by extension, of Baz Bahadur himself. 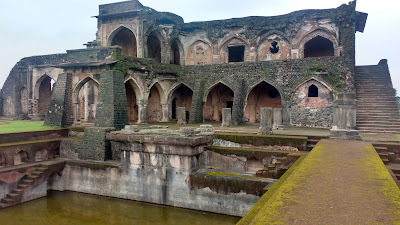 There is a dilapidated structure next to the Rewa Kund. This cluster of monuments is located about 2km to the north of the Royal Cluster and about 300m from the Echo Point. 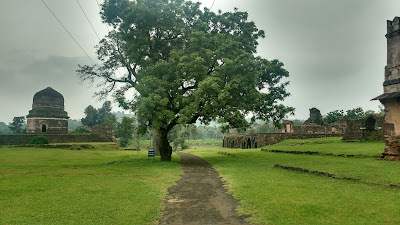 The Echo Point is actually a point on the road which directly faces a building called the Dai Ka Mahal of this cluster. The walls of the monument act as a echo surface for the sound. 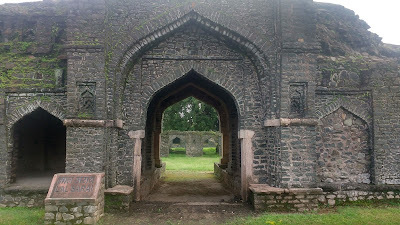 The Malik Mugith's Mosque is 15th century construction by Mahmud Khilj, the father of Malik Mugith. The mosque has been refurbished from an earlier Parmara era temple - most of the pillars are of a Hindu origin. 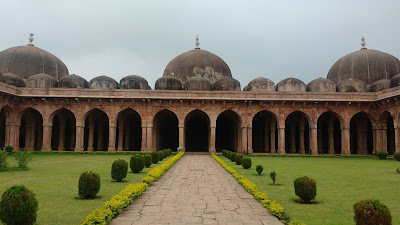 The mosque has an extended semi-circular front porch, akin to a sabha-mandapa of a temple. Opposite the Malik Mugith's Mosque stands its contemporary Caravan Serai. The structure is a large inn with rooms for travelers with a large ground in the middle. There is a small pond in the middle of the ground. A little ahead of the Caravan Serai one sees three tombs spread out over an area. 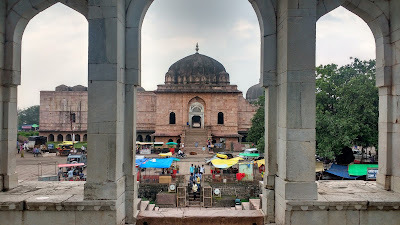 The first one is very specifically called the 'Dai Ki Chhoti Behan Ka Mahal' - the tomb of the wet nurse's younger sister. 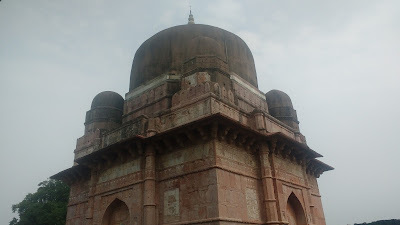 The monument has a dome on an elevated octagonal platform. 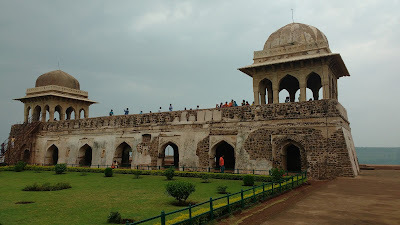 The next tomb is more elaborate though with a simpler name of 'Dai Ka Mahal' - tomb of the wet nurse. 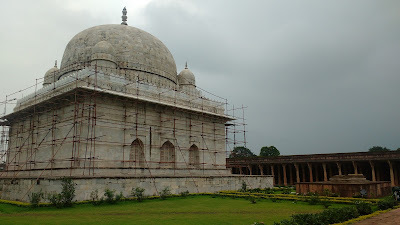 The monument has multiple tombs and a central dome on an elevated square platform with an octagonal neck. The last tomb is similar to the first one in design but is nameless. 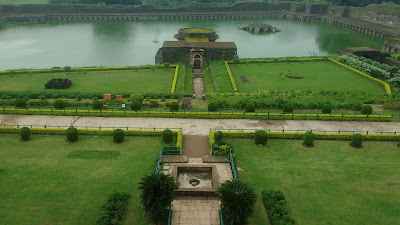 The Lalbaugh Garden is located next to the Dai Ki Chhoti Behan Ka Mahal. The garden had an elaborate system of waterworks and at the extreme end overlooks a ravine that descends to the lower Malva from Mandav. This cluster is located about 1km north of the Malik Mugith Cluster. The Somwati Kund is a simple tank and the Lal Serai is a smaller version of the Caravan Serai. 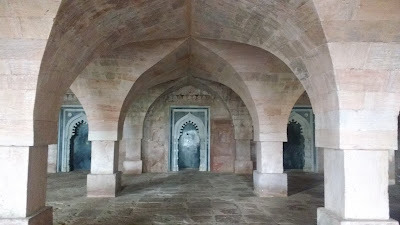 There are two tombs of Darya Khan. 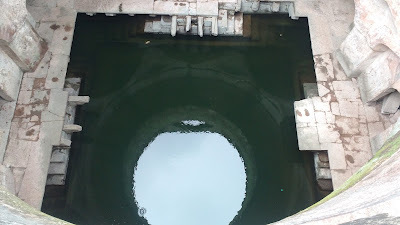 The larger one is next to the Somwati Kund. 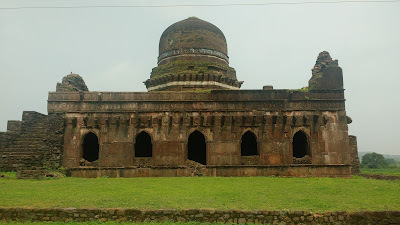 It has an outer structure of vaulted corridors that surrounds the main tomb which has one dome, surrounded by four smaller domes mounted on a square elevated platform. 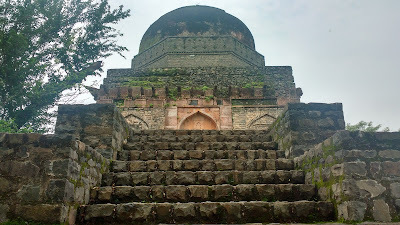 The Mosque of Darya Khan has three domes, the larger of which has suffered some erosion and is tumeroid in appearance. This cluster lies in the centre of Mandav, next to the local market. The cluster monuments are ticketed at a combined price of Rs. 15. The Jami Masjid lies to the east of the main street. The monument, completed in mid 15th century, is one of the largest mosques in India. 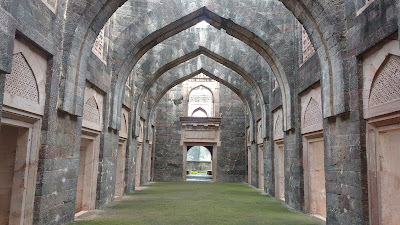 The northern, southern and western walls feature a series of arches and domes facing the central courtyard. 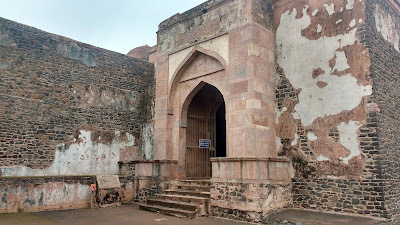 A small door in the northern wall leads to the Hoshang Shah's Tomb and a Hindu style Dharamshala. 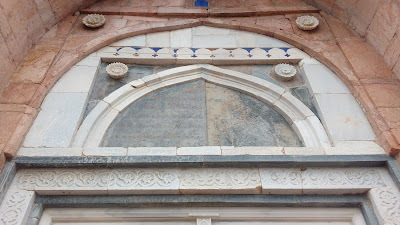 The tomb of Hoshang Shah belongs to the mid 15th century and is entirely built in marble. 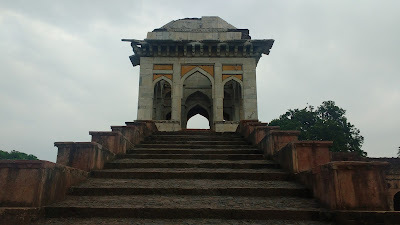 The monument may have served as an inspiration for the Taj Mahal, with its architect Ustad Hamid having paid homage at this tomb in the 16th century. 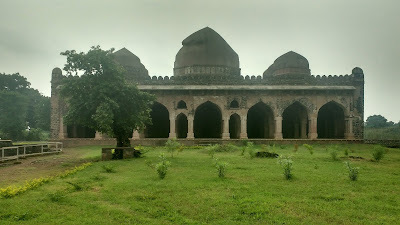 The Ashrafi Mahal is opposite the Jami Masjid on the west. 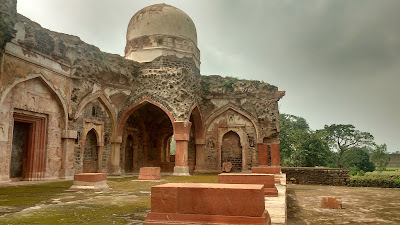 The monument was originally a madarsa built to accompany the mosque. 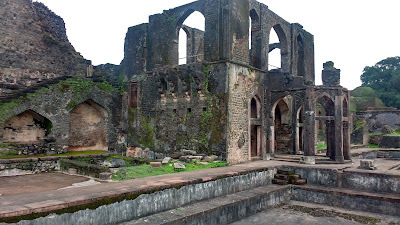 It was later used by Mahmud Khilji to erect a victory tower and as a platform for his court and grand tomb. The tower and the tomb are ruined. 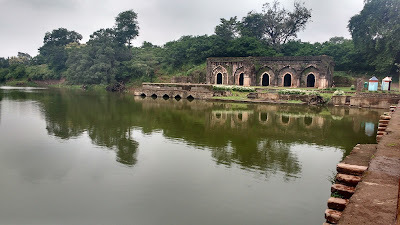 - Taveli Mahal, Jahaz Mahal, Kapoor Talab, Munja Talab, Hindola Mahal, Champa Baoli, Jal Mahal, etc. This cluster, tucked away to the north-western corner of Mandav, is its prime architectural attraction. The cluster monuments are ticketed at a combined price of Rs. 15. 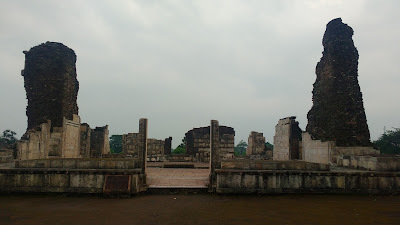 The Taveli Mahal is the first monument here, and has been converted to a museum and administrative office. The museum closes at 5pm - I had to skip it consequently. 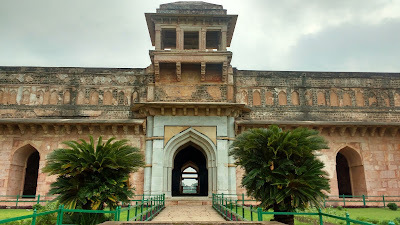 The Jahaz Mahal is a narrow but long palacial monument between the water bodies of Kapoor Talab and Munja Talab. The apparent boat-like shape gives it the name of Jahaz (boat) Mahal. This 15th century pleasure-house has beautiful views over the surrounding water-bodies. 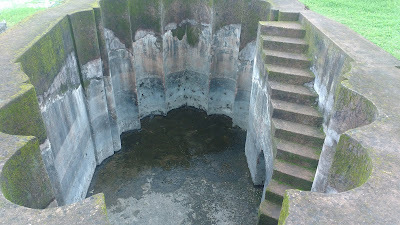 The monument also had numerous water bodies of its own which are dry now. 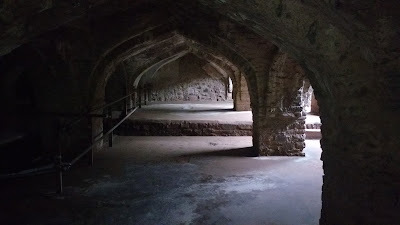 The Hindola Mahal to the north of the Jahaz Mahal served as an audience hall. This 15th century construction is shaped like a swing and has beautiful arches on the inside. The Jal Mahal is located at the far end of the Munja Talab and appears to be a mix of a pleasure-house and bath-house due to its pool-like water bodies. 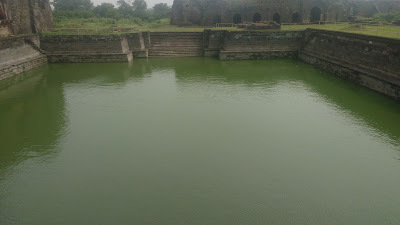 The Jal Mahal along with the Jahaz Mahal on the opposite side put on display the amazing earth-water synergy that would have made Mandav a jewel of the erstwhile Malwa. 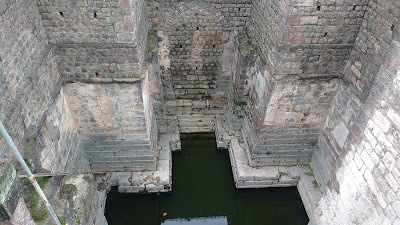 There are a couple of baolis (stepwells) here, along with ruins of other royal monuments which occupy the eastern and norther sides of the cluster. These would be an ideal setting for some ruin-exploring with its multiple levels both above and below ground level, although I'd shudder to be stuck here after dark. These monuments are scattered along the road that leads from the centre of Mandav towards Dhar. 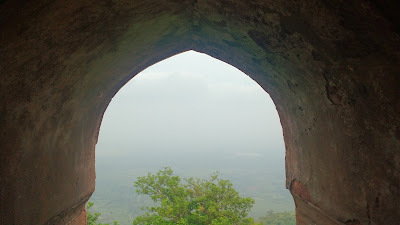 If time permits, one should take the descending walk from the magnificent Delhi Darwaza to the Alamgir Darwaza and take in the amazing views of the Malwa crest with numerous valleys trailing in different directions. Its unfortunate that I could not take pictures of this small walk - I would rank it among the best in Mandav. Mandav is truly a place lost in time. The plateau had been virtually untouched for three centuries. The decay of the ruins has now been arrested. The glory of this old jewel is being restored. The town is welcoming its visitors with its paniya and boabab imlis. So, what are you waiting for?